Hello दोस्तों,अगर आप Google AdSense use करके अपनी website/blog पर ads post करते हैं, तो आपने low revenue (कम income) and AdSense Low CPC की दिक्कत जरूर face की होगी, जो की आपके visitors के ads पे click करने से आपको मिलती है. कई बार आप सिर्फ एक click से ही बहुत पैसे कमा लेते हैं, और कई बार बहुत clicks के बाद भी आधा dollar भी नहीं मिलता ! और आप सोचते रहते हैं की AdSense CPC low क्यों है. 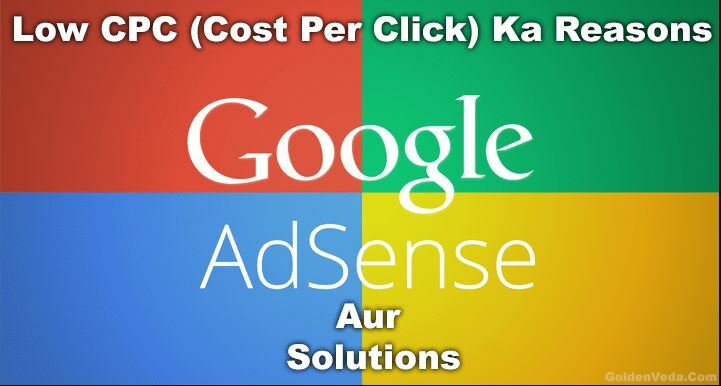 AdSense CPC( Cost Per Click):वो revenue है जो की आपको उन ads से मिलती है, जिनपे आपके visitors click करते हैं. AdSense low CPC होने के बहुत से reasons है and मैंने सभी reasons इस article में listed किये है,जिनको जानकर आप समझ जायेंगे की आपके AdSense Account का CPC इतना low क्यों है ? सबसे पहली चीज़ जिससे CPC rate पे असर पड़ता है, वो है keywords. कुछ keywords से आप हज़ारो dollars कमा सकते हैं, और कुछ keywords से सिर्फ कुछ पैसे ही कमा पाते हैं. Keywords ऐसे words और phrases हैं, जो की आपके webpage पे display होते हैं, और जिन्हें Google pick up करके, उनके base पे ads display करता है. For example, अगर आपने “camera” से related कोई post लिखा है तो हो सकता है की Google किसी camera manufacturer की ad वहां place कर दे. दूसरी चीज़ जो CPC को affect करती है, वो ये है की advertisers एक keyword के लिए आपको कितना pay करते हैं. जैसे जैसे advertisers बढ़ रहे हैं, उनके बीच Competition भी बढ़ रहा है. इसके कारण bid amount भी ज्यादा रहता है, और आप को high CPC मिलता है. Ads का placement, एक और important factor है. अगर आपके page पे 5 ads का space है, तो ऐसी सम्भावना है की highest CPC वाले ads सबसे पहले space में display होंगे. जैसे जैसे आप page के niche आएंगे, CPC decrease होता जायेगा. इसलिए अगर आपके visitors 4th ad पे click करते हैं तो आपका CPC low होगा. Ad types से भी CPC को फर्क पड़ता है. इसका कारण है की Google ज्यादा से ज्यादा पैसे कमाना चाहता है, और उसकी लिए image based advertisement ही ज्यादा पैसे देने वाली है. अब अगर आप Google को ONLY text ads post करने के लिए allow करें, तो आपका CPC तो कम ही होगा, और इस कारण आप higher bids वाली ads खो देंगे. एक और important factor है season! Advertisers holidays और weekends पे low bids वाले ads ही post करते हैं. इसलिए, अगर इस दौरान आपका CPC low हो, तो tension न लें. ये सिर्फ seasonal है ! Highest bids generally work hours और work days में होते है. Advertisers कई बार geographical regions को भी target करते हैं. इसपे आप का कोई control नहीं है. अगर high bidders अपने ads सिर्फ, Europe में display करना चाहते हैं और अगर आपके visitors एशिया के हैं, तो आपके लिए high CPC पाना मुश्किल है. Advertisers अपने ad spaces भी select करते हैं. For example, कोई advertiser बोल सकता है की “मुझे अपने ads page के top पे post करने हैं ” – और अगर आपके page में सिर्फ lower space में ही ads का place है, तो आप वो advertiser खो देंगे. ये थे कुछ reasons जिनके कारण आपका CPC low रहता है.अब जानते है इसका solution क्या हो सकता है. AdSense की CPC mostly आपके blog niche(Topic) पर depend करता है,But मैं यहाँ कुछ tips दे रहा हूँ आपको, जिसको follow करके आप AdSense की CPC increase कर पाएंगे. High CPC Keyword पर Concentrate करे,High CPC keyword find करने के लिए आप SEMURSH paid tool का use कर सकते है or Google keyword planner की help से आप easily and Free, High Bid amount Keyword choose करे. Image and responsive design Ads unit use करे. AdSense Ads को post के above side पे place करे,इससे CTR(Click through rate) बढ़ता है,जिससे CPC भी increase होगा. India and other country के 50% user mobile से Internet use करते है,So आप AdSense page level ad unit का use करे. Too many Ads = Less CPC – ज्यादा ads unit का use न करे इससे आपकी CPC low हो जाती है.1 page में कम से कम 3 unit ads ही use करे. आप high CTR country like US,UK को target करे,इससे आपकी CPC boost जरूर होगी. ऊपर दिए गए सभी trick and tips follow करे,इसके बाद भी आपकी CPC low हो तो आप मुझे comment के through कारण पूछ सकते है. मैंने इस article के through AdSense low CPC के कारण and solution बताने की कोसिस किया है.I hope आपको समझ आ गया होगा.अगर कोई query हो तो openly comment करे. Hindi Blog Banane ke liye Keyword Kaise Search Karen, Kisi Ne Apne Blog Post me Likha tha ki Chating Wali Language me Content Likhen to CPC English ke Barabar Milti hai kya yah baat sahi hai. Nilesh Sir, Mere recipe blog https://lazizkhana.com/ men to hamesha low cpc rahta hai. kya aapki tricks usmen kaam karengi? great topic and solution but mera bhi haal bhiayo ki tarah hi hai……..
plz visit my site and give me a top what to do…. Nilesh main abh adsense kar rahi hun, main anyi hun.mujhe batayein main kya hanges karun.Appake blog ka p kitna rehta hai. Iske bare me mujhe knowledge nahi hai bro..maine uc news ye kaamabhi tak nahi kiya..! Hi, are you getting 11k page views or visitors/day? Do you market your site on social media or is it organic traffic? Bro its motivational site there CPC is low by adsense..but you can try to use more ads and use ads on posts..that can increase your CPC. Nilesh ji, main aapke blog hmesha padhta hun. Ek aur shaandar post ke liye aapko badhai. Main kareeb 6 se 7 ads ek page par use kar raha hu. Par likhta shudh hindi me hun. Visitor to bahut aate hai par cpc bahut low hai . Samay ho to ek baar mere blog ko dekh jo salah ho de dijiye. bahut acha likha hai apne bhai. apki batayi tips par me kaam karuga. why the ways thanks bro. 2.suggested bid matlb hota hai advertising company jo hai….itna bid lagati hai ki ham log usme itna paisa de sakte hai……and comptition jo hai use keyboard ki search volume and type par depend karta hai….like high ranking keyboard me jyda compition hota hai….aap surwat me low ranking keyboard use kare baad me dheere dheere high keyboard use karna start kare ok.
1.aapke content bahut short hai..iske karna Google Adsense ko proper keyword nahi mil pata ads dikhane ke liye,so wah koi bhi ads daal deta hai low cpc wala. 2.apki ads impalement bhi achhi nahi hai,Aap content/post and sidebar me adse impalement kare. 4.Apne bahut se low CPC keyword use kiye hai,uski jagah high cpc keyword choose kare. Hi Nilesh, i had few questions in my mind but i get answer now. there are so many articles on web that tell how to earn from adsense but i have seen very less articles related to increase CPC. Good article and tips too. thanks #govind ji,Bahut se indian blogger low CPC problem face kar rahe hai,So maine article isi liye likha ki un sab ki help ho sake.